BP and Admiral Landry just held a Press Conference in which they said that, based on a decision 90 minutes ago, by the “best and brightest minds” that it was time to move on the next option, the Lower Marine Riser Package (LMRP). BP was unable to block sufficient flow out of the well to make the injection of cement possible, and thus to kill the well. They had made, I believe he said three attempts to inject material (the junk shots) without being able to get that material to block the passages through the Blow-Out Preventer (BOP) . (Unfortunately I missed a large part of his opening remarks, and thus have only the question response to go on at present). The volume of mud used did not appear to have changed from earlier reports at some 30,000 barrels. Mr Suttles said that they had given the technique every chance, but could not get it to start to provide an effective seal. They had, however, determined that the majority of the pressure restrictions to the flow of oil was coming from some resistance within the well itself, and from the BOP. Since the riser above the BOP was not contributing much to the resistance, and thus to control of the oil flow, the next plan is to remove it, using a band saw device (of which pictures will be available) and then to lower the LMRP onto the existing BOP. They intend cutting the surface that the LMRP will sit on flat, so that it will give a good, but not perfect seal. Thus there will be some leakage around the joint, and they will monitor that and use dispersant as appropriate. The new change should take somewhere between 4 and 7 days to implement. The assembly, which has been constructed, and is not the Top Hat assembly built earlier, to fit on the bottom of a riser. Flow of oil from the LMRP will rise up a 6 7/8 inch drill pipe within the riser (the same size as the one currently fitted to the RIT). The riser will also carry hot water down to the LMRP to protect against the formation of hydrates. He noted that their inability to stop the well “scares everybody” but is reasonably confident (no success percentage estimates) that this will collect the majority of the oil and gas. Because they do not know the flow path of the oil below the seabed it is difficult to estimate what is actually going on in terms of oil path below the BOP. Thus they are, again, trying something that has never been done before, but expect, based on the RIT, that it will work. On being asked about the cleanup of the dispersed oil – he pointed out that the reason that the dispersant was used was to break the oil into small droplets. These are small enough to be consumed by the microbes in the sea, and thus there is no plan to do other than let nature take its course. For the oil on the surface, they are getting better at spotting oil pools and sending skimmers to deal with them. The Admiral drew attention to the article on Hurricanes and the Oil Spill which is available at the Unified Command We site. The relief well is about half-way through the rock it must drill (about 6,000 ft below sea level) but progress will slow as the well deepens. HO -- Please correct me if I am wrong. 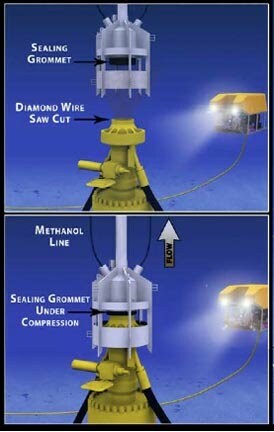 It sounds like the Lower Marine Riser Package cap is intended to capture the flow of oil out the well, not to stop it. The earlier discussion about putting a second BOP package on top of the existing BOP to shut down the flow seems to have been dropped. That second BOP will go back to being used on the second relief well, which will now restart drilling. "Drilling of the first relief well continues and is currently at 12,090 feet. Drilling of the second relief well is temporarily suspended and is expected to recommence shortly from 8,576 feet." So it looks like the plan to kill the well is now down to using the relief wells to pump cement into the formation. The LMRP cap will hopefully reduce the pollution in the meantime. Interesting statement about the 30,000 Barrels of mud pumped. If we make a simplifying assumption that the well has an effective 16 inch ID all the way down, the volume in the well would be around 3,000 Barrels. BP pumped enough mud to fill that 10 times over. OK, let's say that 2/3 of the mud escaped out the BOP, they still pumped enough to fill the well 3 times over. The top kill should have worked. The implication is that the flow path in that wellbore is complicated, and the mud BP pumped did not get into the right place. BP has been quoted saying that the flow is probably outside the production casing. Maybe this is why BP is now focusing on stopping the flow from the base of the well using the relief wells. To think that all of this could probably have been avoided if the last cement job had been 100 barrels instead of 50 barrels! I plan on putting up a post on the LMRP and some of the concerns that I have before too long. Problem is whenever I make such plans something else happens, but it is the plan. If they don't know where the flow is actually coming from it does make the problem of dealing with it a bit more difficult. And so you're right, all they are doing now is a stop-gap measure to capture as much oil and gas as possible and disperse the rest, . . . . . .and hope there isn't a Hurricane. "They had, however, determined that the majority of the pressure restrictions to the flow of oil was coming from some resistance within the well itself, and from the BOP." How would this determination get made? This may be a silly question but what would probably happen if an explosive charge were detonated a few hundred meters into the rock near the blown out well? Wouldn't that choke off the hole? Someone must have already thought of and rejected the idea.